“Cap” Weinberger served as President Reagan’s secretary of state from 1981 until his resignation on November 23, 1987. He presided over an extraordinary expansion of the American military in accordance with Reagan’s hard line against what he called the Soviet “evil empire.” Recent historians believe that Weinberger’s massive military spending program forced the Soviet Union to overspend its faltering economy in an attempt to keep pace. This weakened the Soviet Union, bringing about, first, a thaw in the Cold War and, ultimately, the collapse of Communism. 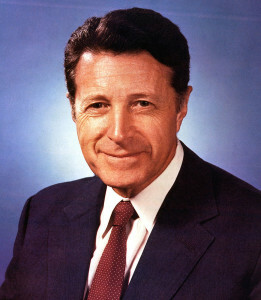 Weinberger ended his tenure as defense secretary embroiled in the Iran-Contra Affair, the major scandal of the Reagan administration. Indicted for his role in Iran-Contra, he was pardoned by Reagan’s successor, George H. W. Bush, before he could be prosecuted.